Why should I send a wedding invitation? I've been asked a time or two from friends or couples planning their weddings, "WHY the heck do I even need to send out wedding stationery? Can't I just email people a wedding invitation?" First of all, excuse me while my paper loving soul cries in a corner for a few minutes. Okay, I'm back and ready to address why it's best to send a physical printed invitation to your guests. Deliver important information: Arguably the most important part about why you need invitations is that you need your guests to know that they are invited and where and when to join the party! If you don't have guests, then you don't really have an event. Show off your personality: Your wedding invitation is an opportunity to show off your personality as a couple. Bring in personal touches that tell your story and fit your event. If you are a fun couple and have a fun love story, tell that with your invitations. If you are a serious couple and love structure and all things elegant, show that off with your wedding paper. Don't be afraid to show who you are. Set the Tone: Your wedding invitation is the first glimpse that your guests will get at what to expect when it comes to your wedding. This is your chance to communicate many things about your wedding. Is your wedding upscale? Do you want your guests to come prepared for an elegant party? a garden soiree? A classy cocktail evening party? Use your invitations to convey that to your guests. You can literally spell it out (ex. "Black Tie" on your invitations) OR you can communicate the level of elegance by the paper you send. What message do you think an e-mailed invitation sends to your guests? What kind of party might they be expecting? People LOVE to get mail that is not a bill. I know this might sound a bit silly, but seriously barely anybody sends snail mail anymore. In our fast paced lives the majority of our information is sent and shared online. Our physical mailboxes get filled up with junk and it's quite honestly depressing. I look forward to the holidays and birthdays because I have a few friends that still send holiday and birthday cards. Nothing makes me more excited than checking the mail to find something that isn't a bill! :::Cue the audio of angels singing::: Your guests will feel the same level of excitement when they open their mailboxes to find your pretty Invitation. Keepsake: You might hear people say, "But it's just paper, everyone will just throw it away"….Maybe I'm a bit biased here because I am a paper nerd, but your wedding invitation will be one of the very few remaining elements after your wedding/party is over and done with. Yes you will have your memories and obviously your photographs. But everything else will be gone. I mean, what do you think happens to the venue, rentals, food? You spend lots of money on those, but those don't get to stay with you forever. Your wedding stationery is a perfect keepsake for you to frame and display, or include in your wedding album to remind you about all the details from your event. 5, 10, 20 years from now you can look back and reminisce about all the details that came together to make your best day ever! When you have good quality wedding stationery, you will be surprised how many of your guests will tell you that they kept your invitation as a keepsake. 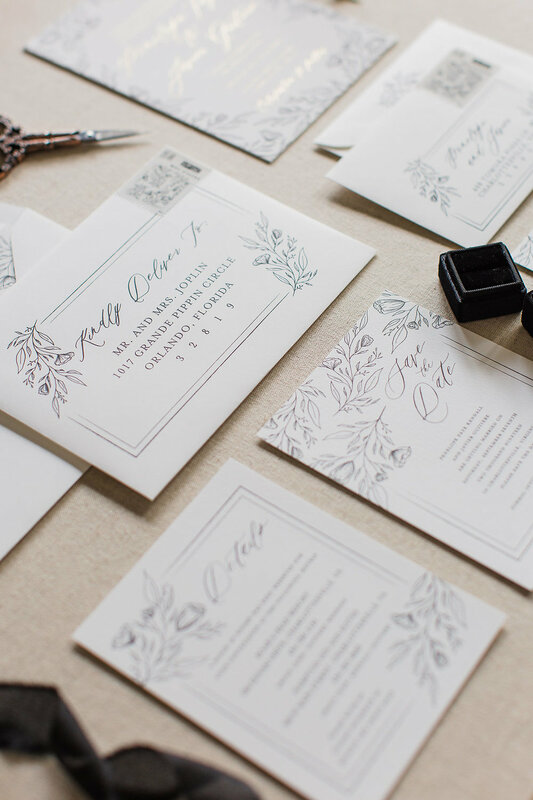 Still not convinced you need to send physical wedding invitations? That's okay, the beautiful thing about planning your wedding is that you can make your own decisions and do what you want! So do what makes you happy and you won't go wrong. Need help organizing your wedding guest list? Feathered Heart Prints is here to help you organize your wedding guest list with a free spreadsheet template that also includes tips and a few commonly asked etiquette questions when it comes to addressing envelopes. So by now you might have started collecting the addresses of all the people you want to invite to your wedding. If you're a weirdo like me, then you love spreadsheets. If you're not a weirdo like me, then spreadsheets might cause you to break out in a cold sweat. Don't worry, I've create a spreadsheet template that not only helps your organize your guest list, but it is formatted perfectly for when your wedding stationer or calligrapher needs the addresses for printing your envelopes. Another *BONUS* to this spreadsheet, is that I have included some pointers on formatting your addresses as well as common etiquette tips straight from the expert, Emily Post, herself. So grab your template today and start organizing that guest list! Abbreviations - In general, abbreviations should be avoided on formal event invitations and envelopes. it is best to spell out all words, such as road, avenue, apartment, etc. As with everything, there are a few exceptions to this rule. Titles - Abbreviations may be used in titles, such as Mr., Mrs., Dr. etc. Space - For calligraphers especially, sometimes words might need to be abbreviated to accommodate for the space needed to fit the entire address. Formatting and Order of Names- This is a big one, and there are different schools of thought on this one. I am coming from a traditional etiquette here with Emily Post as my guide. There are a lot of misconceptions about how to order and format the names on invitation envelopes. I will outline a few tips below. Always address both members of a married couple - regardless of whether or not you know both members socially, both members should be addressed. For example, Mr. and Mrs. Jones. Also acceptable is Mr. and Mrs. James Jones. If you plan to include both members first names, list the woman's name first. So if you want to make sure to include first names it would look like Mrs. Amy and Mr. James Jones. The traditional reason for this is that a man should never be separated from his last name. A more modern approach is to drop the formal titles, so it could just simply read Amy and James Jones. This is more of a semi-formal or casual approach. Listing children - Children's names are listed underneath the parents names. So for example it might say Mr. and Mrs. Jones on the first line and then Becky Jones on the second line. If there are a lot of children or a big family all residing at the same address, you can address the invitation to "The Jones Family". Invitations to unmarried couples - The woman's name is always listed first. For example Ms. Janet Randall and Mr. Joseph Hall. Familiar titles - You can use familiar titles instead of formal titles if you prefer. Example: Aunt Donna, Uncle Larry. This might be best in an inner envelope. For formal invitations it's a good idea to consider inner and outer envelopes. For outer envelopes you have the main address and invitee information. And on the inner envelope you would list everyone's individual names who are invited. So for example you might have "The Jones Family" on the outside envelope, and then "Amy Jones, James Jones, Becky Jones" all listed on the inner envelope. This also helps take away any miscommunication about who exactly is invited. For more in depth tips and pointers about all things etiquette, consult Emily Post. The template shared in this post is for personal use only and cannot be redistributed for commercial use. The dreaded guest list. Who's in and who's out? Okay, so before you break out in a cold sweat, mounds of crumpled paper at your feet, tears streaming down your cheeks as you cry out in distress shaking your fist in the air at the ghosts of wedding etiquette past, let's talk a little bit about who the HECK to invite to your wedding. We all know that crafting the perfect guest list that satisfies all the important people in our lives can be a much more complicated experience. So fear not, my friend, I have created a handy dandy flowchart to help walk you through creating your perfect guest list. Before we get into that, let's talk about where to start. My best advice is to write down everyone that you want at your wedding and everyone you feel like you *should* invite to your wedding. Go through and put a star next to everyone in that list that you 100% want at the wedding and have no doubts about what-so-ever. Then go back through the list and put another shape or colored star next to the people who you really want to be there but might be more on the fence about. Leaving the people who maybe feel more like a "I should invite this person but don't know if I really want to" without any marks by their names. Discuss with your fiancé (or family depending on if you will be getting help) what your desired budget is for your wedding and determine what is doable for you guys and what your ideal guest number would be. Then go back through your lists and see how far off you guys are from the desired number of guests and the number of guests you have written down. If the numbers are close then you are good to go, because remember that not every single person you invite will be able to attend your wedding. But if the numbers are very far off then sit down with your fiancé and start to ask yourselves the tough questions of who's in and who's out. If you have hired a wedding planner (which I very much encourage you to do so!) this would be a great time to get their advice as well. They can help you plan your wedding according to the number of people you want to invite and the budget that you have in mind. It might just mean looking for the perfect location that can accommodate your list and not break the bank. Or it might mean some compromises somewhere else. *free for personal use only, may not be duplicated, sold or used in any commercial purpose.